BEAUTIFUL CREATURES are hungry. Hungry like wolves!!! Like it or not, if it wasn't for the energy of 'sleazy' rockin' music - from the early days of HANOI ROCKS to the immense late success of CRASHDIET - the map of (in general) 'hard' Rock music would end up to (only) love songs. 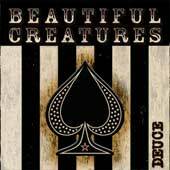 BEAUTIFUL CREATURES and Deuce mean it; eat your heart out and stand aligned to their beliefs. It was of hot surprise for the band - featuring the cult prowling figure of Joe LeSte (BANG TANGO) plus Mark Simpson (FLOTSAM & JETSAM, LYNCH MOB, BANG TANGO) - to ink deal with the Warner Bros label, not due to any potential incapability but solely regarding the year and state of Rock (2001). Their same-titled debut - same year - featured the 1 A.M. tune presented at the Valentine movie OST, plus some extra recognition due to their appearance at the 2001 American Ozzfest itinerary . Still, bad sales and a subsequent Warner Bros 'let-go' endangered the band's future. Thus, it surely is good news to see Deuce hitting the stores, initially in 2005 (Japan/USA - with somehow different tracklist) and now in Europe for the first time. Deuce is the kind of an album that would score grand sales/reputation if the Rock music world was rolling normally post-early 90s. Gathering elements form the AC/DC legacy, the HANOI ROCKS testament, the GUNS 'N' ROSES willpower, the whole late 80s 'sleaze' LA scene and the Punk Rock attitude, the track listing features short in-your-face songs with endless power and some maniac vocals by LeSte; some of them in a philthy direction while the rest based on distorted approach (not my kinda taste, but I must admit it suits really fine). Some slow tempo ballads enrich the alnbum's picture while this current European edition adds four demo versions as a 'goodie' offer.